We left for Petrograd one Thursday evening, on the Siberian Weekly Express. The station is one of the finest in the East, but inside was a dirty, swarming mass of soldiers, provocators, and thieves, filling up every nook and corner of restaurant, waiting-room, and platforms. The majority were trying to arrange last-minute passage, or were there merely for the sake of loafing and making trouble. A Russian officer told me that we were more fortunate than the members of the Root Commission, whose train was despatched in secret from a point outside the station, for fear of a demonstration against the "American bourgeoisie." At Harbin, twenty-four hours from Vladivostok, there was a lively hustling by the porters, trainmen, and many passengers, to load up with great quantities of Japanese loaf-sugar and all manner of non-spoilable foods. This, I learned, was the regular practicepeople making the long trip for the sole purpose of smuggling across the Manchurian border thousands of rubles' worth of necessities for the hunger-stricken cities of Russia. Among the passengers was Major D, a Scotchman, born and bred in Russia. He always read the Siberian papers as we received them along the way, and often related tales of the plains he knew so well. The major pointed out one station where several men had recently been killed by order of workmen who had come from the cities and found that too little had been changed from the old routine. Faded, torn red flags floated from every station. The old station-masters, however, have never been removed. They still dress in their bulky black coats, and go about their business, leaving politics to those who have more time. The Bolsheviki have recognized, as did the Kerensky officials, that there was one institution it was unwise to interfere with too much; and so the trains have been left free to go along under their own momentum as long as they will. 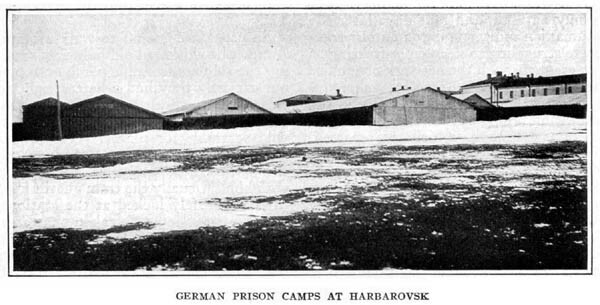 We found most of the German prisoners quartered in the east; the Russians had taken no chance of their walking home. They were all securely interned and strictly watched. At Krasniarsk, a Danish prison-worker told us that he was looking after six thousand soldiers and four thousand officers. He remarked that they were receiving the same food rations as the poor classes in Petrograd, and they didn't have to stand in line all night to get it.
" But the men go mad without work," he added, "so I secured for many the privilege of helping on the streets. The Russian soldiers are really jealous, but they won't do the work themselves." Click pictures and drawings to download higher-resolution versions. image processing, layout, and presentation here copyright TravelHistory.org.